When an alarm signal is received from your home or business, a Racomtel professional officer can alert you, the police, Local Security Company we work with, fire department or emergency personnel right away. So, whether you’re there or away, you have protection, which acts like an invisible blanket around the people and things that value most to you. At Racomtel, we have a comprehensive network of dedicated Customer Monitoring Centers backed by powerful equipment and trained professionals. So if connections to a home security alarm monitoring center are interrupted, one of our other centers takes over promptly, giving us the ability to offer continuous security through our advanced alarm monitoring service and ultimately providing you with peace of mind. 1. 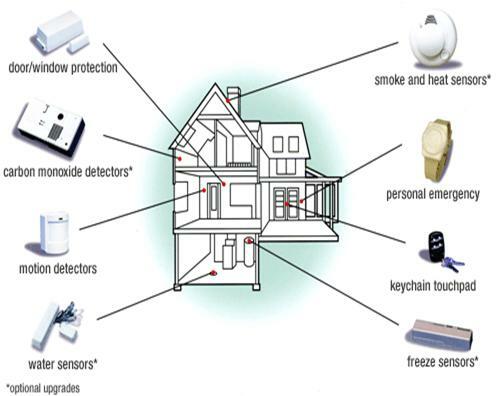 The home/Office is monitored 24 hours a day through the installed system. In the event of an emergency, the system can transmit a signal to one of Racomtel's five monitoring centers. 3. Local authorities can be notified to dispatch to the home to determine the cause of the disturbance and to respond to emergency situations. (Police we work with or the Local security company we work with). your system will be designed to allow for easy expansion and integration with existing and future property and life protection systems. Our use of common platforms including HID readers and common controllers assures you of easier upgrades and avoids obsolescence. Racomtel Security is provided access control systems. We work with the best manufacturers and have developed long-term relationships that are enhanced by our thorough understanding of industry components, technologies and equipment. Our extensive supply of parts including CPUs and servers are inventoried locally, so delays are avoided. Our choice of equipment is based on the best available, not the best of one brand. Better yet, every one of our installations is backed by our premier service and the largest fleet of field-service technicians of any independent security system provider in the Ghana and USA.